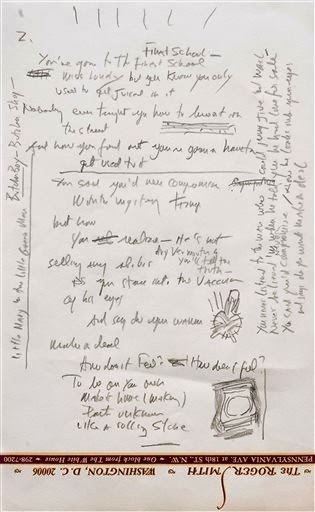 Bob Dylan's working drafts of Like a Rolling Stone and Hard Rain are going to be auctioned by Sotheby's. One of the most popular songs of all time, Bob Dylan's "Like a Rolling Stone," is going to auction this summer. 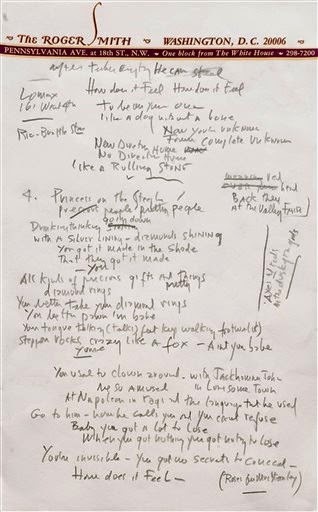 Sotheby's is offering a working draft of the finished song in Dylan's own hand for an estimated $1 million to $2 million.The song is about a debutante who becomes a loner when she's cast from upper-class social circles. Both manuscripts offer a great deal of information about Mr. Dylan’s writing process, or at least, about ideas that ran through his mind as he worked on those songs. “Hard Rain,” from 1962, is on pages ripped from a spiral notebook, and is in virtually finished form. But marginal notes are plentiful. They include a quotation from the biblical book of Jeremiah (“Before I formed you in the womb, I knew and approved of you”), the notation “diamond desert” to the right of the second verse, and what appear to be unrelated notes referring to titles of books and records. Probably most telling, if also uncharacteristically obvious, given that most listeners regard the song as a vision of a post-nuclear landscape, are the names Hiroshima and Nagasaki. The “Like a Rolling Stone” manuscript, written on stationery from the Roger Smith Hotel in Washington, has similar marginal notes, including record titles (“Midnight Special,” for example) that could relate to his composing process, or might simply be contemporaneous notes he made on an available scrap of paper. But because this four-page version is from earlier in the process than the “Hard Rain” manuscript, it also shows the song as very much a work in progress. 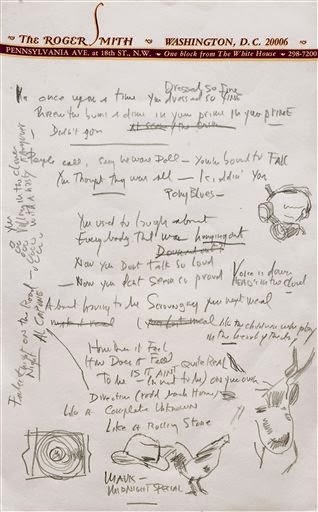 Sotheby's expects that the auction may break the record, now held by John Lennon's A Day in the Life manuscript.